At Bluff Creek Dental, we're proud to provide expert dental treatment in a warm, welcoming office environment. Our team of experienced dentists and highly trained dental specialists work hard to treat every patient on an individual basis, designing personalized treatment plans that perfectly suit each patient's unique dental needs. We offer a wide variety of treatments for a diverse range of dental problems, one of the most common of which is dental fillings. 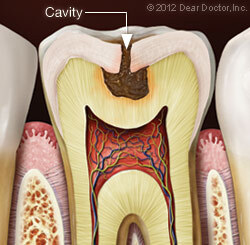 Cavities, holes in the teeth caused by decay from bacteria, are one of the most common dental problems. In fact, more than 75% of people get a cavity by age 17. Dental fillings treat cavities and stop tooth decay, preventing further damage to the inner tissues of the tooth and restoring the look and function of the tooth. Fillings work the way one might expect—they use a strong, biocompatible material to fill the cavity and stop decay. Without a filling, the decay might progress to the soft, sensitive pulp at the center of the tooth, which would require a root canal to treat. Before beginning treatment, we perform an x-ray on the tooth to understand the true extent of the decay. After analyzing the x-ray, your Chanhassen dentist will anesthetize the tooth and remove the dead and decayed tissue, then clean away any remaining bacteria or debris. Once the tooth is clean and free from decay, your dentist will apply a translucent cement and add the filling material, which hardens into a strong, durable replacement for the lost portion of the tooth. At the end of the procedure, your tooth will be as strong as ever and look like a normal part of your smile. Metal Filling: These classic, silver amalgam fillings have been used for more than a century, and offer a strong, inexpensive filling material. Because it's made of metal, though, it's more noticeable than other types of dental fillings and your tooth may require more drilling preparation. Cast Gold: While expensive, cast gold fillings use a gold alloy to provide an extremely strong, durable, and long-lasting filling. The gold is very noticeable, but depending on your preference, this may be a desirable outcome. Tooth-Colored Fillings: Composite fillings mix plastic and glass to create a tooth-colored filling that's durable and about as long-lasting as a metal filling. They require less drilling to prepare the tooth, but they're also more expensive than metal fillings. Porcelain: Dental ceramics are durable, natural-looking, and won't stain the way composites sometimes do. While brittle and sometimes more expensive than composites, they're one of the most aesthetically pleasing types of dental fillings. Glass Ionomer: These inexpensive, translucent fillings are made from a mixture of acrylic and glass powders. They don't last as long as other types of dental fillings, but they blend in with your natural teeth well and release fluoride over time, helping to strengthen teeth and prevent decay. After you get your dental filling, your mouth may be numb from the anesthesia for several hours. Until the numbness wears off, try to avoid drinking liquids that are too hot or too cold, and chew with the side of your mouth opposite the new filling. It's normal to experience some sensitivity to temperature for the first few weeks after receiving your filling, but if it continues for much longer than that or you have pain when biting down, let us know—we may need to adjust the filling. You can brush and floss normally, and you'll still want to visit your Chanhassen dentist twice a year for regular check ups. With conscientious oral hygiene and regular professional dental care, your filling will last years and your smile will last you the rest of your life. Dental fillings are one of the most common procedures our dentists perform, and if you think you might need one, we're here to help. Feel free to book an appointment online at our Chanhassen, MN office. Or if you have any questions, go ahead and call us at (952) 679-6360 or reach out to us at our contact page. We look forward to hearing from you, and we're excited to help you achieve a healthy, beautiful smile!